As I sat there looking out the car window, watching the terrain go from dusty, sandy colored plains to verdant and lush valleys to snow-capped mountains all in a span of a few hours, I couldn’t help but think, really? THIS is what Morocco really looks like!? If I wasn’t seeing it with my own two yes, I would have had no idea how diverse Morocco was. It truly is a place that blew me away with its beauty and its wonder. And considering I got to see a very large chunk of the country and spent nearly three months traipsing around, I think I have a pretty decent handle on some of the best things to do and see. I won’t make this post TOO long (by my standards, which means it will probably still be over 3000 words…) because I have a SLEW of blog posts on Morocco already. Literally, everything you read here has a blog post that goes into even further detail about the specific destination. I explored and wrote everything I could on backpacking in Morocco and I hope this helps you better plan your trip. What you have below are three separate one-week Morocco itineraries. If you’re here for three weeks (or preferably more), you can do it all! If you have a short time, just choose your favorite of the three weeks and mix and match. I have some options below as well as to what I would skip if I absolutely had to (it was a very tough decision!) 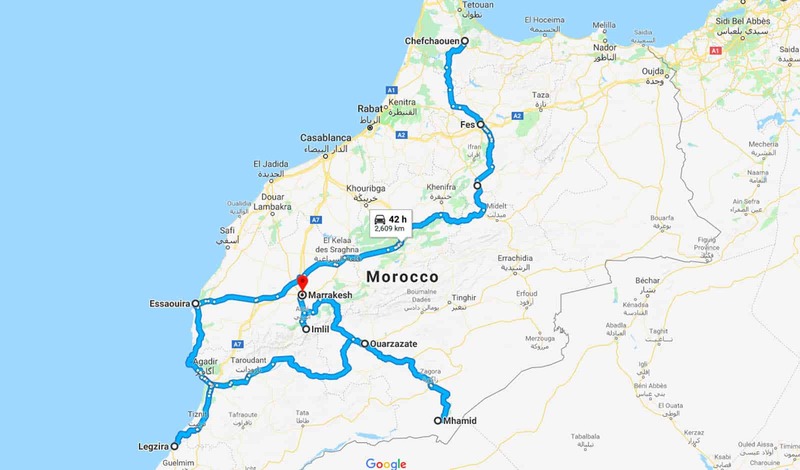 but I honestly think every place on this itinerary through Morocco is 100% worth it, so if you can stay for longer, do it! A quick visual preview of this Morocco itinerary because I LOVE maps. 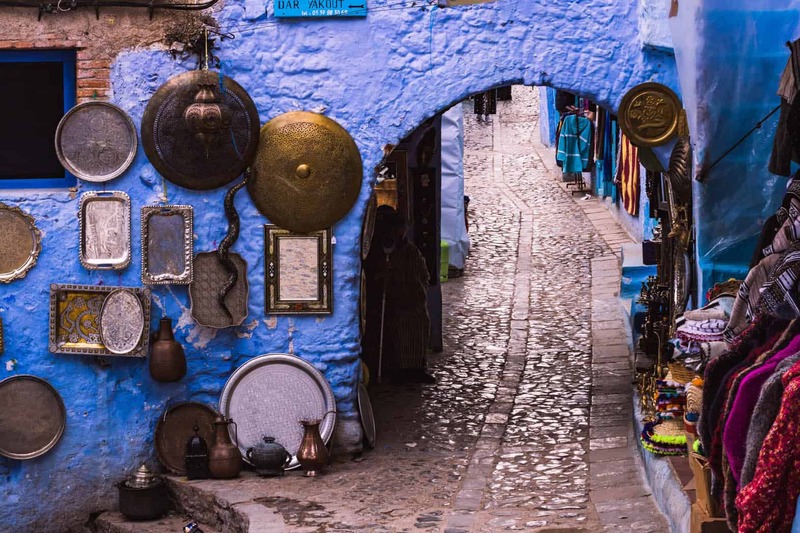 Say you’re on a tight schedule for your Morocco itinerary, and you just want a quick peek at the country. You’ve got one week. Well, you’re in luck! That’s plenty of time to get to know three of the most popular cities with two days each. 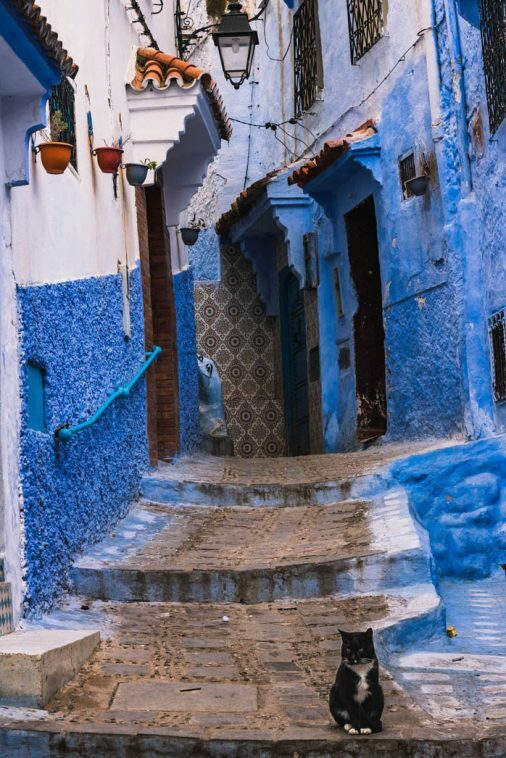 Start out taking in the vibrantly blue streets of Chefchaouen. Two days here is totally enough even with a hike to a waterfall built in (or not, whatever). Getting lost in the blue. 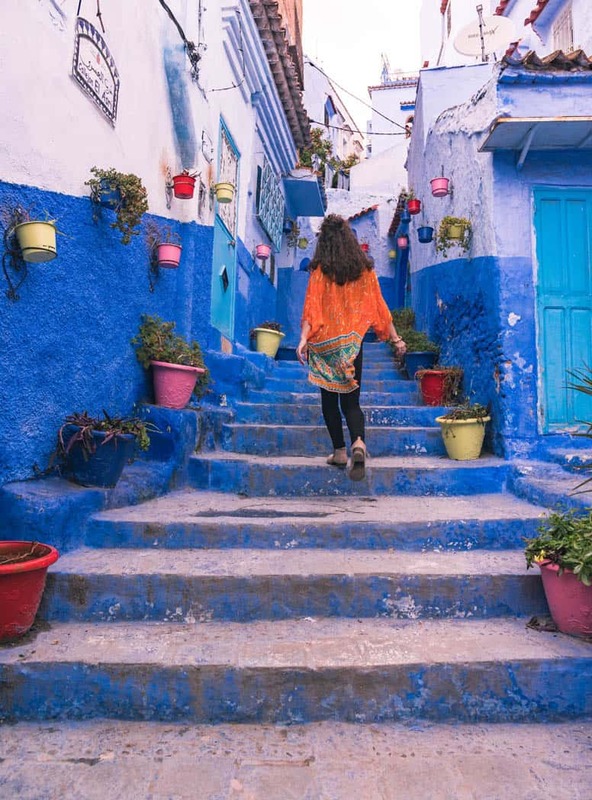 Chefchaouen is a mixture of city meets nature. On day one, you can simply get lost in the city. The city is an instant shock to the senses; it definitely lives up to its reputation as the blue city. Meander through cobblestoned alleyways and take in the shades of blue on the buildings. Find your way to the souk and get some quality shopping done. You’ll encounter all the jewelry, spices, perfumes, and cloth you can imagine, at top quality and low prices. 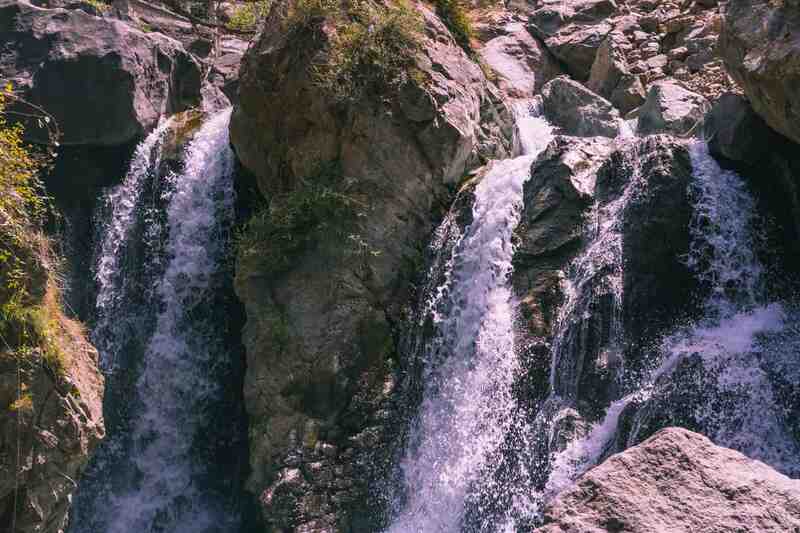 Then, to give your senses a break from this testament to the boldness of man-made architecture and design, catch a cab out to the waterfalls, the Cascades d’Akchour. Only 30 minutes away is a breathtaking two-hour hike across a rock bridge to a cascade that will blow your mind. You won’t believe you’re so close to civilization. The trip is so quick you can even head back to the city afterward for more exploring. Fes is a wonderful city to get lost in, the tanneries, the ridiculous labyrinth of a medina, and the historical sights will easily captivate any wanderer. You’ll feel both lost and found in only a few days. No joke, when I call this place a labyrinth, I mean that in the literal sense. You could potentially just stay lost the entire time here, but that’s not only OK, it’s the whole point! Hides drying on tombstones in Fes. Fes is much busier and more populous than Chefchaouen, so plan to have your senses not just shocked but assaulted. Take your time so you don’t get overwhelmed. Breeze in and out of shops, check out the famous tannery (plug your nose; freshly hung hides are pungent!) and experience an authentic meal. 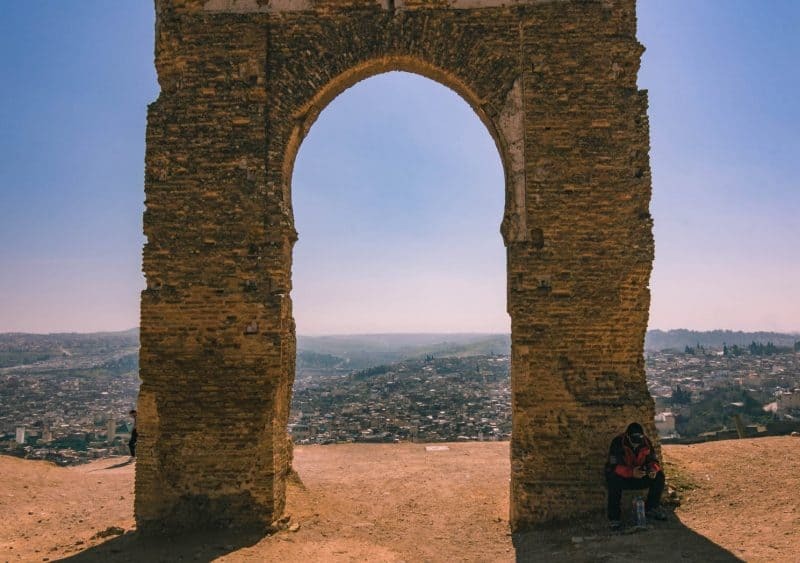 I love my viewpoints, and luckily, Fes has a beautiful one so you can see the entire city from above. Merenid Tombs on top of the hill are totally worth the hike up. The ruins and cemetery just below and across the streets are also worth a wander. I even witnessed locals setting out the dyed hides to dry on all the tombstones. Want to know more about Fes and Chefchouene? Check out this post. Marrakesh is a chaotic beautiful hot mess. It’s a place not meant for every traveler, but if you’ve only got a week to backpack Morocco, it could be a great experience. The mix of old and new here is stunning. One minute you’re in a home of exotic, interconnected gardens, and the next, you’re in the Yves St. Laurent art gallery. Who knew? 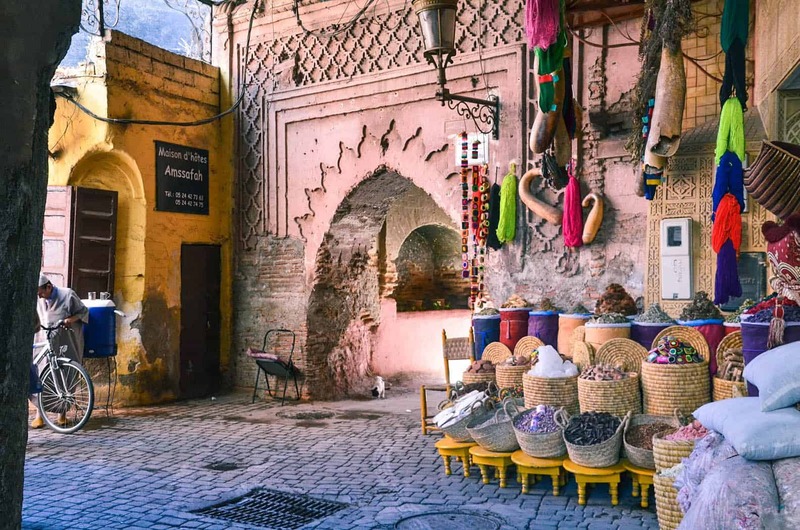 Marrakesh is the place you want to go to experience urban anarchy, to visit an oasis, take a hot air balloon ride or just chill at your boutique riad and munch on olives in front of an air conditioner. 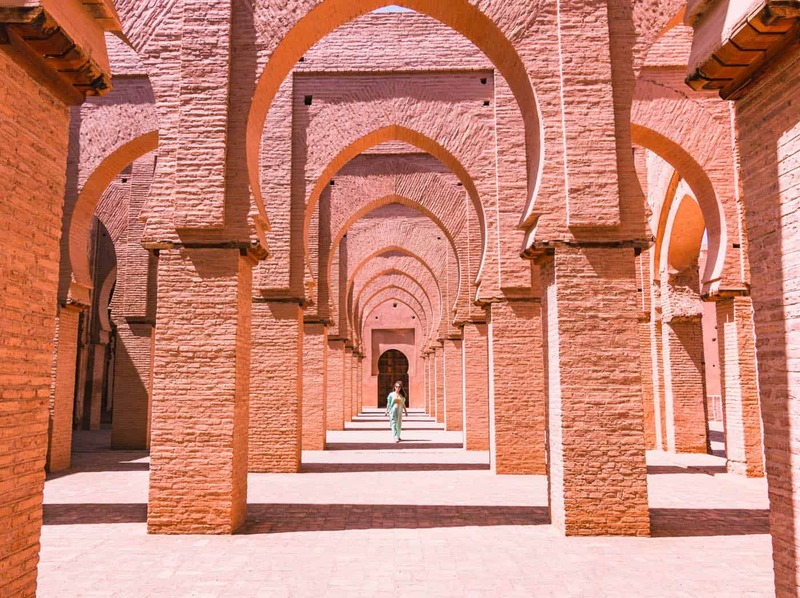 There are so many reasons to visit this city, not the least of which is that most well-connected flights come into and out of Marrakesh, which makes this city a great starting or ending point. Are you a city slicker at heart? You better slap Marrakesh onto your Morocco itinerary. Just know Marrakesh isn’t for the faint-hearted. It’s disorderly, people can be a bit in your face, and scams run rampant here more than most of the rest of the country. Keep your wits about you. It’s going to be OK, and this is all part of the ride. It’s a good base for flights and day-trips so if anything, you’re welcome to spend more time outside, than inside the city. Interested in day trips and tours from Marrakech? Check this out. Raise your hand if all you want to do is beach bum or catch some killer waves off the coast for your week backpacking in Morocco! I feel you. We spent nearly two months backpacking Morocco’s coastline alone and surfing whenever possible. If you’re learning to surf, I’d recommend staying at a surf camp for this part of your Morocco itinerary. These camps are so much fun that after just one week learning how to surf, I’m hooked. I’m now off and away surfing other spots in Morocco, up into Portugal, and any other surfer friendly coastline I can find on my travels, all on my own. I’m no pro, but that week-long camp taught me the basics I needed to get me started. If you’re interested in spending a week in Morocco at a surf camp, hang ten with me here. Keep in mind surf camps usually are for a week or more. So while it’s amazing, I hope you have more than a week to spare because it would be a shame to miss out on surfing or the rest of the country. 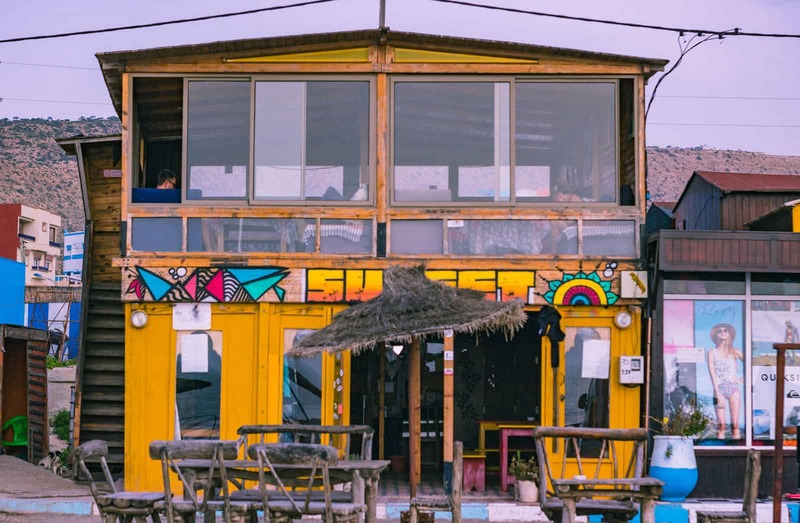 Want to know my recommendation for a badass surf camp in Taghazout? Check this post out. Already know how to surf? Well, look at you-you little surfing pro, welcome to paradise! The Moroccan coast is a surfer’s dream, and you’re almost guaranteed to find epic waves around every corner. Imsouane has the longest right break in the country and one of the longest on the continent. Taghazout is a personal favorite as I spent some time there, and if kite or windsurfing is your thing, head to Essaouira. 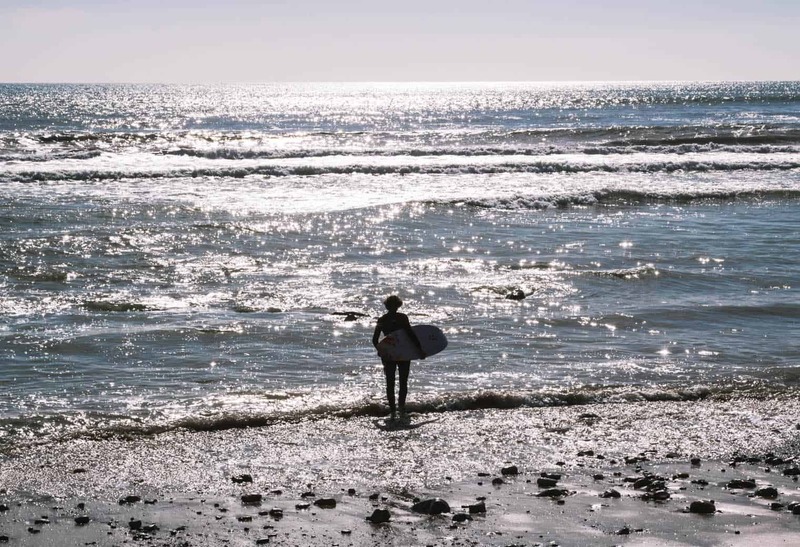 There’s almost no shortage of radical surf spots, and the rentals are cheap too, so no worries about bringing your own boards if you can’t or don’t want to. We were paying around $7 for a board and wetsuit rental for a whole day! Sweeeeet! We visited Mirleft which I could have got lost in for a week if given the opportunity and tiny Legzira with its big beautiful arch and ravaged coastline could have totally taken me hostage with no complaints. 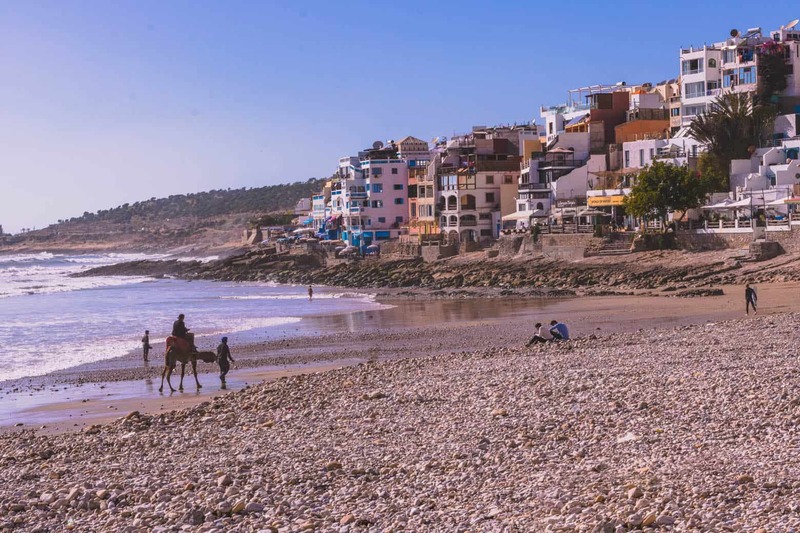 Taghazout’s beach is lined with little riads, surf camps, and restaurants. Oh, and camels roam the beach. 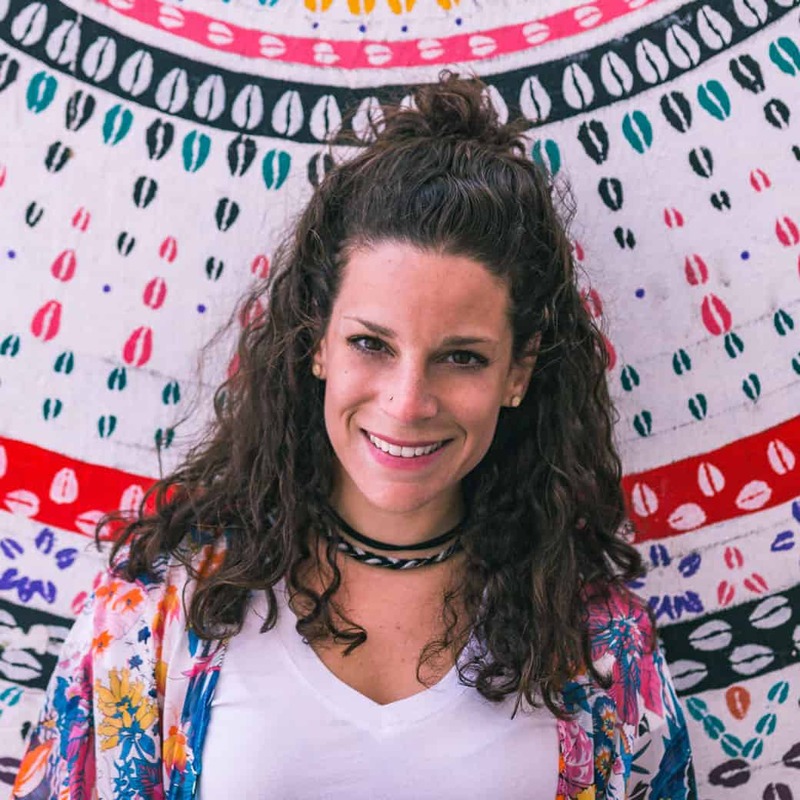 I could keep raving on about the cool coastal towns, which even if you don’t surf, are legit worth visiting simply to hang out and beach bum but we have other wonderful places to visit on our Morocco itinerary that I need to tell you guys about! Read more about backpacking Morocco’s best beach and surf towns! Starting from either the coast or from Marrakesh, you could trickle inland/down south, going from cold snowy mountains to the dry hot desert. This is Morocco after all, and, literally, all climates are possible. Scratch that, not possible, probable. I was blown away (almost literally at some points, looking at you Essaouira) by the fact that Morocco has every type of climate and terrain that you can think about. If you’re anything like me, the first thing that comes to mind when you think of Morocco is hot deserts but it’s so far from what Morocco is. Just wait until you get here, you won’t believe the diversity of this country and perhaps this part of the Moroccan itinerary shows it off best. TIP: Read up on the best times to visit Morocco (hint, you may need a jacket and gloves!) and make sure you know exactly what to pack as well. 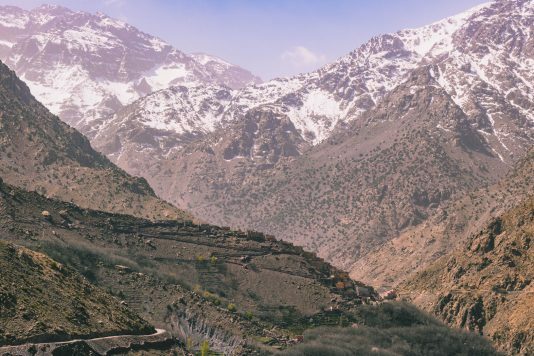 Take on an intense two-day trek to North Africa’s, and the Arab world’s, highest peak, Toubkal. The cute little town of Imlil is the base for the monster trek; in fact, it was created specifically for hikers and visitors of this gargantuan mountain. You can do a quick one day trek around the valley (the chill, laid-back way) or trek Toubkal (the daaamn I need a foot massage by the end of the day way). Climbing Toubkal takes two days and one night, and you must be guided. During the more wintery months, crampons are needed, and snow graces the peaks! Of course, you could go during summer, but remember it’s close to a dry hot desert, so it will be, um, yea, hotter. Read more on trekking Jebel Toubkal. BONUS: If you happen to be road tripping the country (more on this in a sec) I HIGHLY recommend making a pitstop at Tin Mel, it’s about an hour south of Imlil. Considering non-Muslims are not allowed in any of the mosques in Morocco, this abandoned and an absolutely gorgeous open-air mosque is a real treat. Make this a pitstop, you won’t regret it. Tin Mel Mosque—words fail me. 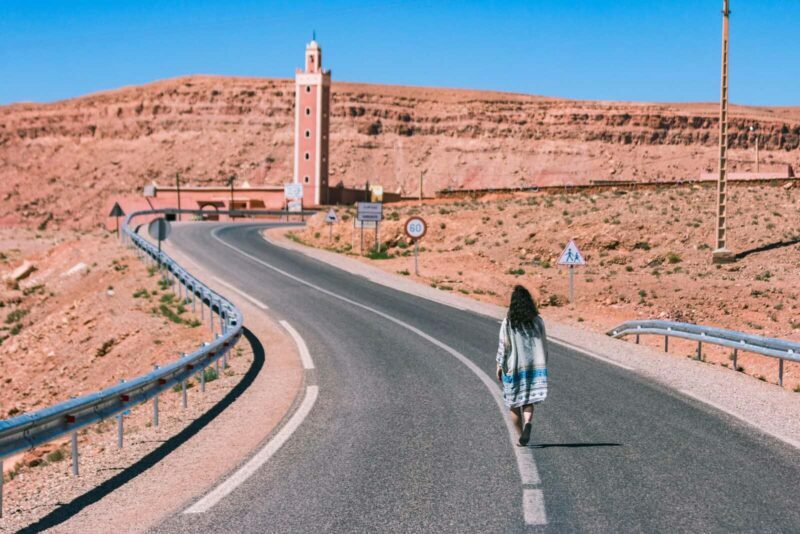 As you follow your Morocco itinerary down towards the desert, a stop around Ouarzazate is certainly worth it, especially if you’re a movie buff! Most notably, Game of Thrones has made this area really blow up, with the popular Ait Benhaddou being THE spot to go. And yes, the entire area is pretty fascinating, seeing all of these buildings and fortresses built into the earth. But there are plenty of less touristy and way cooler things to do around. Kasbah Tamdaght outside of Ouarzazate. Even though I’ve never seen a single episode of GOT (so shoot me), I know enough to know you’re probably pretty anxious to stand in the same place where the Targarians unite with the Starks. Apparently, it’s a big deal…? I also got to scramble around a super cool movie set (GOT and about 200+ other were filmed here) with nobody else around too! While Ait Ben is for all the GOT fans, I think the significantly less touristy Kasbah Telouet is only like x1000 more magnificent. Definitely take the gorgeous one hour detour north. 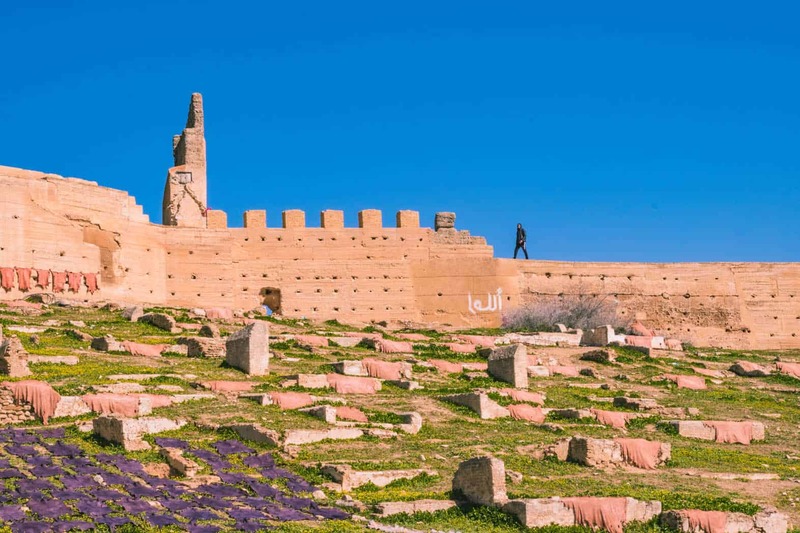 Convinced that you should visit Ouarzazate? I thought so… Read more about the things to do here. And finally, a mere few hours south of Ouarzazate, you find yourself in the middle of the Saraha desert. No big tourist center, no massive tour buses, this isn’t Merzouga’s side of the Saharan Desert. It is the beautiful, pristine, untouched African desert outside of M’hamid. When visiting the desert in Morocco you have two choices although most only know of just one. 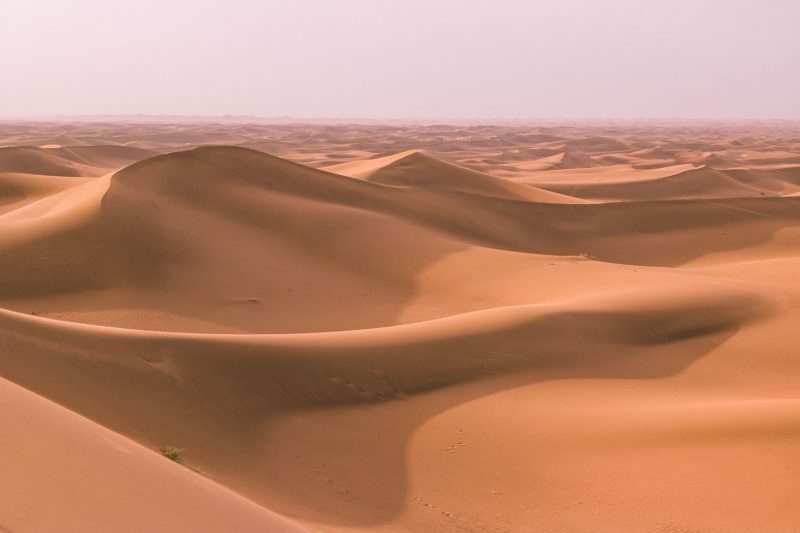 Merzouga, while I haven’t visited, from what I’ve read, heard, and spoke about with others, including locals, is the “commercial” Sahara Desert. 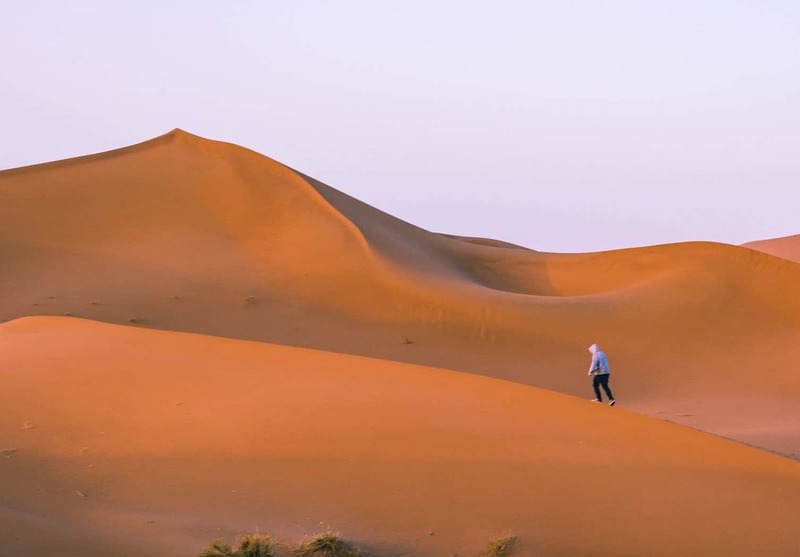 Should you want wilder dunes, more adventure, fewer tourists, and an overall more authentic experience, use M’hamid as your entrance to this enthralling section of Morocco. Wow. There are almost no words to describe the enormity and dramatic views you get standing on a sand dune with nothing but orange, yellow, and even pink hills of sand for miles and miles, with waves like an ocean unfolding before you. No sounds. No life. Nothing. It’s incredible, and 100% the top experience on my backpacking Morocco trip. A tiny Garrett in the Sahara Desert of Morocco. Do not pass go, do not take that super touristy ride through the desert. See what I’ve got in store for you; you’ll see the Sahara like few ever get to experience it. Something to write home about. Read more about how to have an epic experience camping in the Sahara Desert. Ok, If You Had to Skip a Few Places, What Would You Skip? If this was me, I would honestly skip the bigger cities. And dare I say, even Chefchaouen? I loved them, don’t get me wrong, but these bigger cities are more intense, more expensive, and overall a bit more “samsey.” Marrakech and Fes particularly. Chefchaouen is nice but it literally is a blue city, that’s it. Of course, you’ll need at least one of the larger cities as your arriving and departing destinations but just cut back on the days spent there. Along the coast, I’m a huge beach bum and I loved them all so much… I hate to pick and choose but if I had to, I’d skip the more northern beaches. Taghazout to Essaouira is very windy which doesn’t make for a good beach day (although none of the beaches are truly for prancing in bikinis if you ask me). However, if I was coming to surf, it would be the opposite, I’d skip Mirleft and Legzira in the south. Out of all the adventure-y ones I mentioned, don’t dare skip the desert. Don’t even think about it. 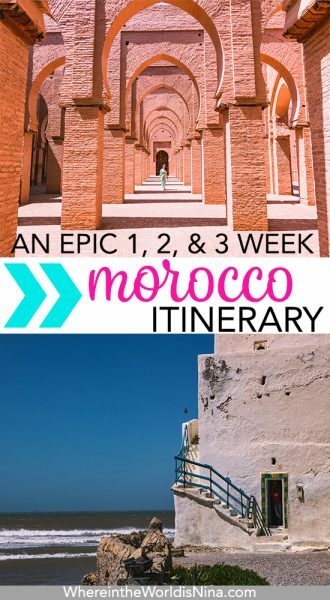 How to Do This Morocco Itinerary: Bus, Plane, Train, Car?! Well, there are numerous choices but I only think one of them is the best option! 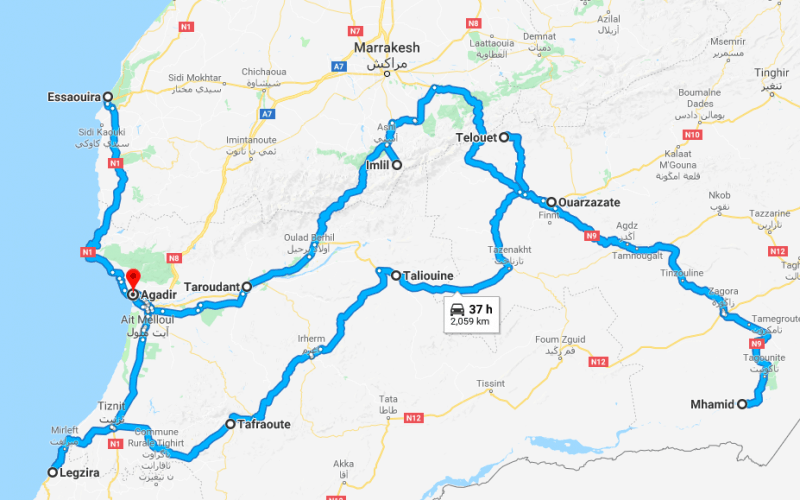 You could, of course, take tours to most of these place, hire a private driver, or take public buses and then taxis to the specific places… BUT the best way to backpack Morocco properly is to drive it. It will, hands down, be the most enjoyable way to see everything here and to be honest, the quickest way too. To be totally clear: We landed in Fes, took the bus to Chefchaouen, then back to Fes to take the bus to Taghazout. After that, we drove everything else. I know backpacking in Morocco on a budget may be your goal but this will be money well spent! There were a few small detours but this is more or less our exact route that we did on our Morocco road trip route. You will surely need to add on transportation days if you are taking buses and you won’t get to see some of the “in between” cool spots. The one week Morocco itineraries will need more like 8-9 days so you have a bit of room to breathe after taking buses. You won’t be as free as you are when you have your own car. Driving around Morocco was one of the most incredible experiences I’ve had traveling thus far and it was simply, magically AF. I can’t recommend it enough! Read everything you need to know about renting a car and driving in Morocco here. Still curious about some other aspects of your trip backpacking in Morocco? Like what to wear, how much things cost, maybe some tips about the country in general? How about when to visit?! I know, there’s still so much to discuss, right? Luckily, I answer every single one of those questions for you, but in another post (we’re over 3000 words, guys, I need to shut up…) Just look below and click away on everything else backpacking Morocco related. I hope this was helpful! 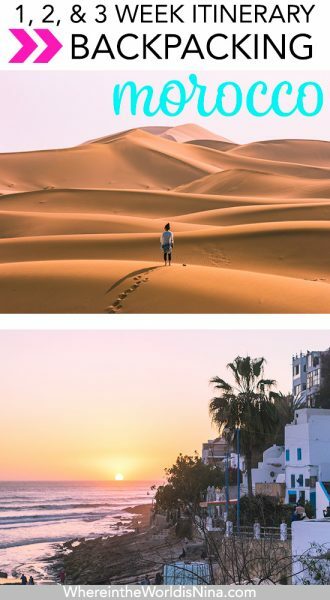 Tell me about which Morocco itinerary you’re going for? Or are you going for everything (highly recommended)? Wow! 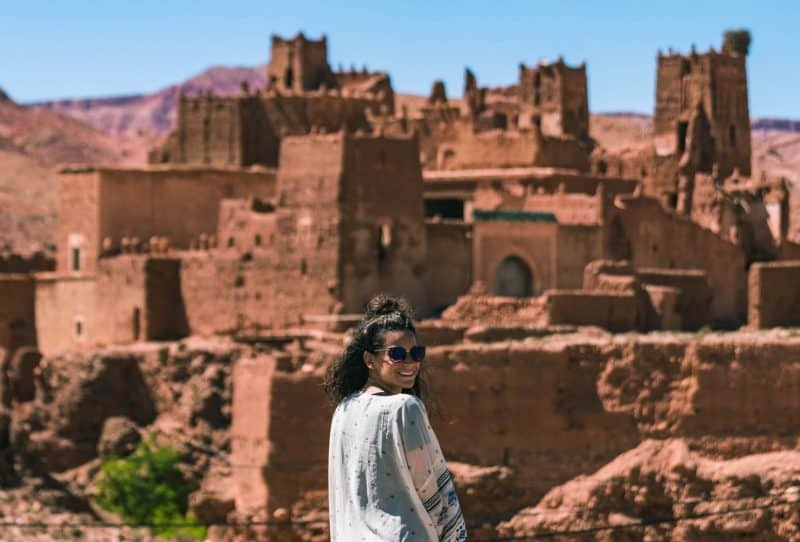 Morocco seems so picturesque and stunning, Nina! Backpacking there sounds like so much fun. I loved your itinerary and I hope to use it soon.